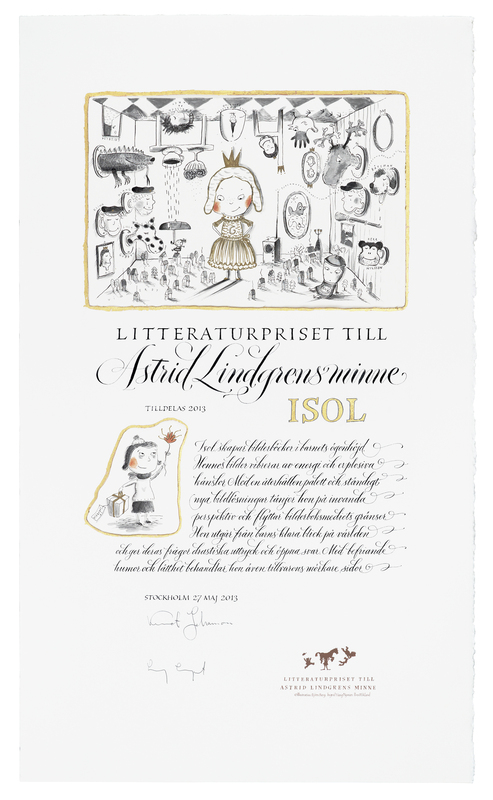 Diploma for 2013 Astrid Lindgren Memorial Award. Illustration: Maria Jönsson. Calliagraphy: Marianne Pettersson-Soold. Photo: Bengt O Pettersson. Two artists have been involved in the making of this year’s diploma, illustrator Maria Jönsson and calligraphist Marianne Pettersson-Soold. There´s much work and thoughts behind every diploma. – “At Griselda’s home” (working title on the diploma) became an illustration inspired primarily by Isol’s books Numeralia and Beautiful Griselda, says Maria Jönsson. In Griselda, heads are falling in large quantities, because of Princess Griselda´s beauty, so I thought it was a good idea that some of Astrid Lindgren´s characters – Emil, Båtsman, Karlsson on the roof, Katla, Simon Small and others – became “emblems” at the home of Griselda. – It was tremendous fun and inspiring to illustrate the diploma even if my pen and brush trembled on a number of occasions. Calligrapher Marianne Pettersson-Soold has worked with the style of the text, a work that requires both precision and accuracy (even the ALMA logo is made by hand). – It´s labour of love but it takes several hours to complete the design and lettering, says Marianne. It´s indeed a handicraft. The slightest mistake I make and I have to start all over again. I always work with three sheets of paper, in case anything should go wrong, and in the end I choose the best of them. – The most important thing for me is to get the balance right between illustration and calligraphy so that my lettering interacts well with the image, Marianne continues. This year’s illustration is pretty delicate and I tried to find an expression that fit the bill. I´m quite pleased with the final result. 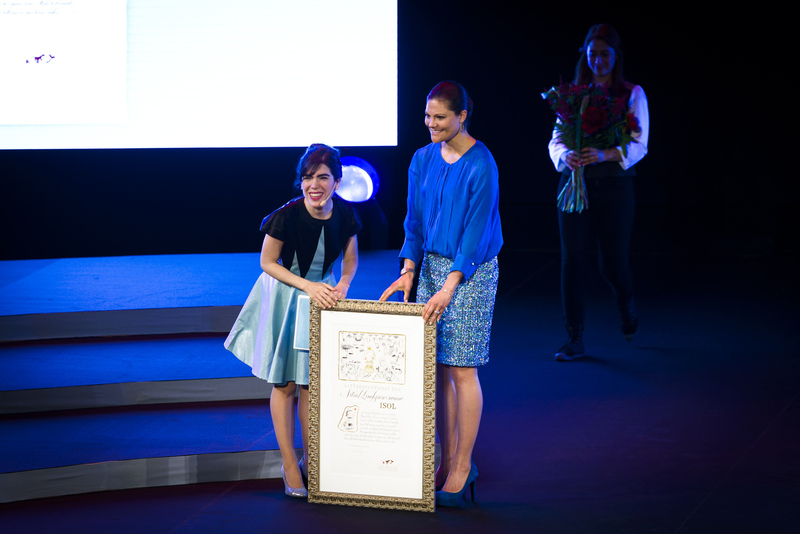 HRH Crown Princess Victoria presents the Award to Isol at the Award Ceremony on May 27. Photo: Stefan Tell. This entry was posted on June 28, 2013 at 11:28 am and is filed under Uncategorized. You can follow any responses to this entry through the RSS 2.0 feed. You can leave a response, or trackback from your own site.